Late in the summer of 2015, I began a letter writing project with a friend. We chose to focus our exchange (mostly) on our creative lives and how everything else affected our ability to become more devoted to our creative needs and desires. Eight months later, we are still exchanging handwritten letters around the subject of our creative lives and creative living on the whole. It’s been an incredibly nourishing project and process. I’ve long preferred paper over email and cannot imagine why we didn’t begin writing sooner, yet it also forced me to take a good hard look at my need for instant gratification. What happens in that in between times as I wait for the next chapter to arrive in my mailbox? What will she think of my letter? Was I too honestly naked? How does waiting for an answer to a question make me feel? How does it nourish me creatively and spiritually? I anxiously await the next letter. When it arrives, I savor it once and then again and maybe after a third (or fourth) reading, I pen a response. And then the process begins again. The slower pace of letter writing is forcing me to slow down and is training my focus. In my inability to get an answer as quickly as my instant-gratification-trained brain would like, I am learning the virtues of patience in other areas of my creative life as well. During the in-between times, I am anxious to not only receive the next letter, but more inspired to put my pen to paper and work on projects. Writing letters has forced me to dig a little deeper, be more vulnerable, be more honest, and be a bit daring. Since I began writing letters by hand (and writing in a paper journal), I more easily process my thoughts, emotions, and the world around me. I’m not alone. Research shows that writing by hand helps us process information in a more conceptual way. While this study wasn’t about the process of letter writing, I can tell you that the process of laying open my dreams and fears on paper to a trusted soul via paper and ink has been a process that has helped me look at my creative life from a different lens. 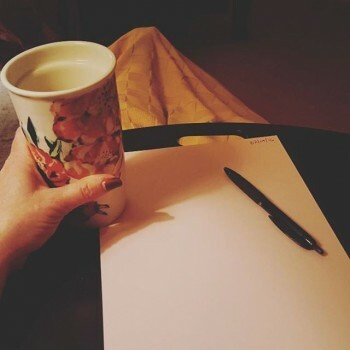 Writing letters has been a loving way to tend my own creative life and my guess is that no matter who you are, taking a pen in hand and penning a missive to someone you trust would benefit your creative life as well. If you aren’t sure who you would (or could) write to, might I suggest some options? What if you were to write an open letter to a faceless, nameless stranger? Open letters can be good for the soul. What if you took some advice from Chronicle Book and wrote one (or more) letters to the folks they suggest? You know that apology you’ve wanted to make but can’t quite make yourself pick up the phone? How about you put it on paper and drop it in the mail? How about writing little love notes to your significant other and tucking them into lunch boxes and underwear drawers? What if you were to pen a missive to a younger version of yourself? Or a future version of yourself? Write a letter to your muse or mentor (even if that mentor is long gone or fictional). 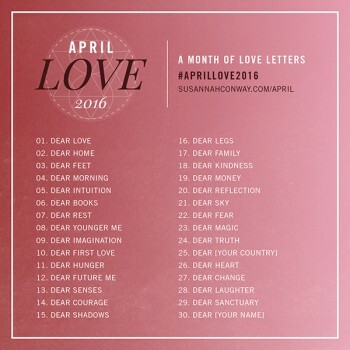 Write a series of love letters to yourself in your journal. 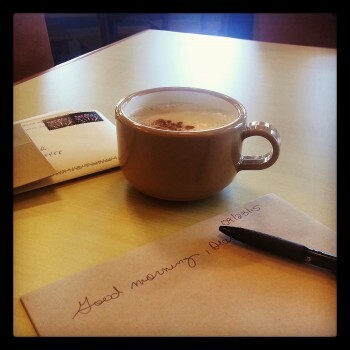 What if you were to write letters to various aspects of your life and yourself? I’m not the only one here at Modern Creative Life that loves letters. In fact, we’ll be happy to take your letter for publication. Debra Smouse is a self-admitted Tarnished Southern Belle, life coach, and author of Create a Life You Love: Straightforward Wisdom for Creating the Life of Your Dreams. She resides in Dayton, Ohio where she practices the art of living with the Man of Her Dreams. When she’s not waiting for the mailman, you’ll find her reading or plotting when she can play her next round of golf. She’s the Editor in Chief here at Modern Creative Life. Connect with her on Twitter, Facebook, and Instagram.